BOOTS CAMARGUE CASSEROLE DISH x 2 OF SET USED GREAT CONDITION NO CHIPS OR CRACKS NO LIDS JUST CASSEROLE DISHES MAYBE OF USE TO SOMBODY WHO HAS THE SET 1 - 9" 1 - 7.5" Lovely Item To Add To Your Collection Smoke & Pet Free Home Please Feel Free To Ask Any Questions Thank You Very Much For Looking Please Feel Free To View My Other Listed Items GREAT GIFT.....🎁 👍👍 😊😊 Photographs are a vital part of the description, please study all images carefully. I am happy to answer any questions you may have and provide further images if required. All questions will be answered promptly so please contact me before buying or before leaving feedback if you have any issues. Beautiful vintage 10" dinner set from early 80s in Irish Camargue design. Purchased from Boots Cookshop. Brand new, never used. Found in our loft after clearout! Set of 18 plates: £132 Individual plate: £7 each Nearest offers welcome. Boots camargue tea and coffee set. Boots camargue tea and coffee set. 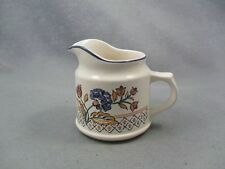 In excellent condition 6 mugs, tea pot coffee pot milk jug and sugar bowl. Dispatched with DPD courier. Boots Camarge Design Milk Jug. Dispatched with Royal Mail 2nd Class. (All sizes approx.). 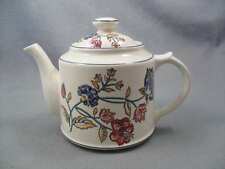 Boots Camargue Large Teapot. Large teapot from the Camargue dinnerware range by Boots. Make Supersized Seem Small. 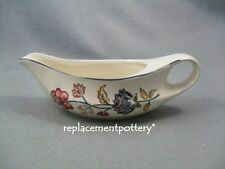 BOOTS CAMARGUE small lidded dish/trinket dish. 4 inches wide and 15 inches high. In good condition, no chips . Design is still clear and bright. Late eighties early nineties popular design I will combine postage with other items where possible. Thank you for viewing. Beautiful vintage 7" dinner set from early 80s in Irish Camargue design. Purchased from Boots Cookshop. Brand new, never used. Found in our loft after clearout! Set of 12 plates: £80 Individual plate: £6 each Nearest offers welcome. BOOTS CAMARGUE Tea Cup And Saucer. The colours are nice and bright, little signs of use. Boots Camargue. Small 1.25 Pint Tea Pot, Tea for Two. This lovely Boots Camargue Aladdins lamp shaped gravy boat and milk jug/ sauceboat have only ever been on display on my kitchen dresser and have never been used. Made in the UK. Dishwasher, freezer and microwave proof. CAMARGUE PATTERN. IN VERY GOOD CONDITION. Boots Camargue. 4 x Napkin Rings. Typically this affectsNorthern Ireland, Isle of White, Isle of Man, other Isles and Highlands. MILK / CUSTARD JUG. " CAMARGUE ". LARGE 6" TALL. 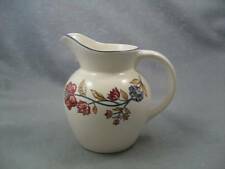 Large 1 Pint Milk / Custard Jug. Boots Camargue. Price is for 1 jug, 2 available. Make Supersized Seem Small. One small chip in outside rim as shown in pic. 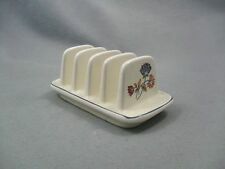 BOOTS CAMARGUE CHEESE / BUTTER DISH WITH COVER IN VGC. BOOTS CAMARGUE CHEESE / BUTTER COVERED DISH IN VGC. Boots Camargue. Milk Jug & Sugar Bowl. 4 BOOTS CAMARGUE CUPS AND SAUCERS IN VGC. Boots camargue Lidded domed butter / cheese dish. Dispatched with Royal Mail 2nd Class. BOOTS CAMARGUE SUGAR BOWL. Approx 10cm diameter No cracks or chips.... Dispatched with Royal Mail 2nd Class.